The theme park savior we've been waiting for? Or is that impossible... even for Lasseter? “The Next Walt Disney,” a title attached to John Lasseter a few years ago, admittedly had me excited. No, I never for ten seconds thought he’d hold a candle to Uncle Walt, but compared to the other clowns trying to run Walt’s company, Lasseter appeared to be the theme park savior we geeks had been waiting for. Among the many differences between Walt and John, one is more important than all others. Lasseter is a creative genius who is trying to fix what has already been done with the Disney parks. Walt Disney was a creative genius who did what had never been done. “Hold on. JL pioneered CG animation, something that had never been done.” Yes. He sure did. And he did a bang-up job. In the world of CG animation, he is king. Allow me to be clear on one thing: Two thumbs up for the accomplishments of Pixar and their brilliant leaders, including JL. We are talking about theme parks though. Lasseter has, with help from Jobs, Catmull, and others, built what is quite possibly the only existing near-perfect creative environment… no thanks to the Eisner Disney Company. Can a similarly creative and successful environment be established at WDI? I have spent time at the Pixar Animation Studio. I walked the halls, seen their creative process, and mingled with talent. I was delightfully overwhelmed at the amount of talent oozing out of the place. I worked off-site on a few small Pixar marketing projects. I met with Lasseter both at Pixar and at the parks. We spoke of animatronics, animation, and even about his and my careers. His face lights up when you talk about Disneyland . He enjoys talking about the time he worked as a Disneyland custodian and Jungle Cruise Skipper. He couldn’t be more genuine and passionate about so many of these things. The Pixar studio itself radiates a sense of passion. In the animation wing of the Pixar building, Disneyland memorabilia artfully clutter every hallway (along with other cool memorabilia). The big “D” from the old Disneyland sign on Harbor Blvd. is there. Props and themed offices are everywhere, including at least two offices with secret passages. A set of actual Chuck E. Cheese animatronic figures greet you around one corner. It is a wonderland second only to W.E.D of the 1960’s. One thing is for sure. The appreciation for Walt Disney’s legacy does not go unnoticed. Lasseter’s office (next to Steve Jobs’ simple-as-can-be office with one desk, two chairs, an iMac and notheing else) is a perfect reflection of everything he is passionate about. Looney Toons animation cells, stuffed Miyazaki animated characters, an original Sunday Peanuts comic strip signed and gifted to him by Schulz himself, original Lucas Films artwork, toys galore, Pixar stuff of course, and an impressive collection of old and new ViewMasters and slides. A collection of model trains on one wall and on another wall, a photo of JL with “Nine Old Men” famed animator, Ollie Johnston at the Disneyland Railroad tracks next to the full-sized train Ollie sold to JL. One thing really caught my eye. A stack of “Extinct Attractions” DVD documentaries. Hmmm. Clearly, no lack of love for what I consider the right way to run a Disney theme park. A return to the old-school? Jim Hill Media reported a couple years ago that Lasseter wanted to fix Journey Into Imagination. Journey was one of the documentaries in his office. He was reported to have wanted Western River Expedition to be built at Hong Kong Disneyland, DCA or elsewhere. After reading this I mentioned it to Marty Sklar. Marty hadn’t a clue that Lasseter ever mentioned such a thing. He said “I highly doubt that would ever happen. That thing is too expensive.” That thing? I got the impression that Marty wasn’t on-board for any more glorious animatronic-filled attractions. He also mentioned, “Mickey Mouse Review was boring.” Oh and he too threw in the “they say John Lasseter is the next Walt Disney” line while we were conversing. I lose no sleep at night pondering the future of Pixar Animation. It’s exactly where it should be and I love it. I do however fear the path Disney theme parks are on. Questions. Are the Sklars of the Disney Company the ones who are holding Lasseter back? Is it the notion that today people won’t respond to how things used to be done? Is the (false) doctrine of “Pixar is the only thing that sells” the only thing driving new development? Has Lasseter bought into the idea that more and more Pixar attractions need to fill the parks because no other Disney-related entertainment has been successful lately? Are Lasseter’s theme park tastes influenced too heavily by his involvement with Pixar animation? Are we to settle for Pixar-based attractions that slightly resemble classic rides? One concept pitched and green-lit was the idea of a hub-cap flying saucer attraction for the new DCA Cars Land. The Imagineers said they were excited to see what JL had to say about a ride inspired by an old-school Tomorrowland attraction. He was impressed. To be fair, a lot of the ($1.1 billion+) DCA improvements are not Pixar-based. JL is championing the effort to bring more heart, soul, and emotional impact to the life-lacking park. Thank you for that. Answers (according to me): In a nut shell, the current philosophies of Disney management prevent Lasseter from doing certain things he’d love to do. When two ideas are presented- one that completely appeals to nerds like you and me (fixing Journey, Western River Expedition, etc. ), and one based on something that recently made $800,000,000 at the box office- you can guess which will win. So here we have it. John Lasseter loves good-quality Disney. He also likes Pixar stuff in the parks. He also has bosses who like to say “no”. He also is spread like too little butter over too much toast. He also has a wreck of an animation studio (Walt Disney Animation) to fix and a thriving animation studio (Pixar) to help maintain. 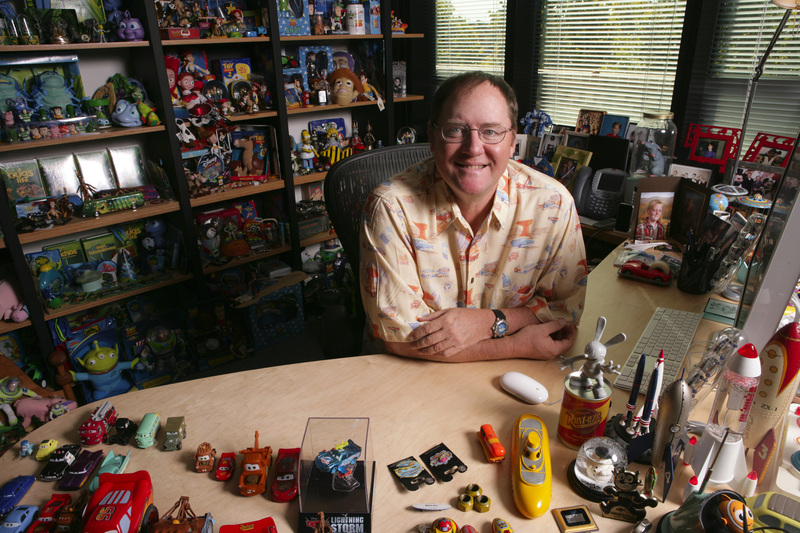 So love, hate, and John Lasseter… Love his passion. Love his successes in the CG animated industry. Love his potential to positively influence what I hope can be a new generation of Imagineering. But by golly, I hate singing fish and joke-cracking monsters in Tomorrowland. Hate Woody dancin’ around the Diamond Horseshoe Saloon, or even worse, Woody and pals (and any other character for that matter) in “it’s a small world”. And I will hate to be an old man at a Disneyland that doesn’t resemble the Disneyland I knew as a young child.